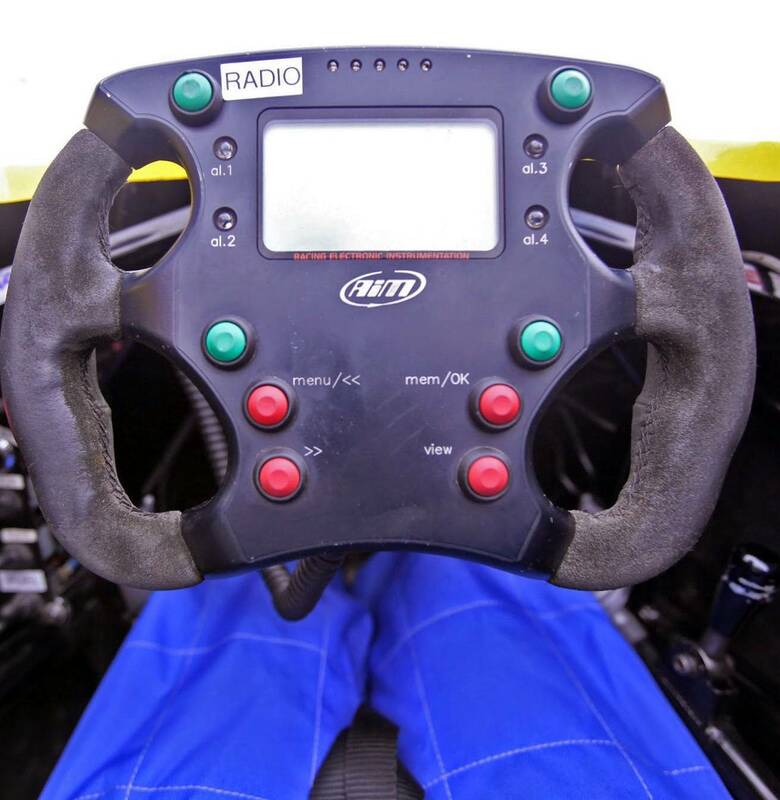 Despite knowing nothing about auto racing – or even how to work a manual transmission – when offered the chance to drive a race car, I seized the opportunity. How hard could it be? All the while I was secretly praying there would be some sort of crash course or even a beginner car for babies like me, who are too lazy to drive anything but automatic. No such luck. The event, hosted by Honda Canada, was held at the Canadian Tire Motorsport Park in Bowmanville, Ont., an hour outside of Toronto. 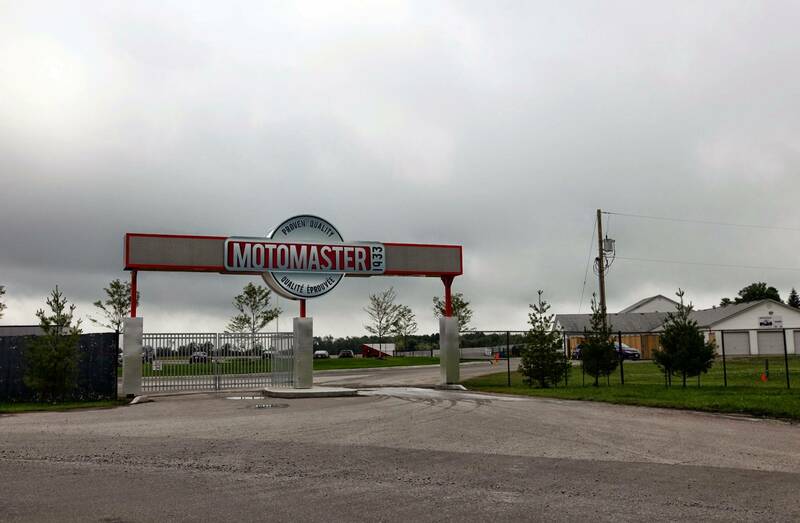 Since it was founded in 1961, the 900-acre facility has hosted just about every class of road racing on its famed 3.957 km circuit, including Formula One, IndyCar, motocross and karts. It was a grey, rainy morning and the track was slick with patches of water which, according to the professional driving instructors, would make driving more difficult – or more fun – depending on how you looked at it. Wonderful. In teams of three, they outfitted us in thick, fire-retardant jumpsuits and heavy helmets. I waddled to the track in my gear and gracelessly flung myself over the cement wall. 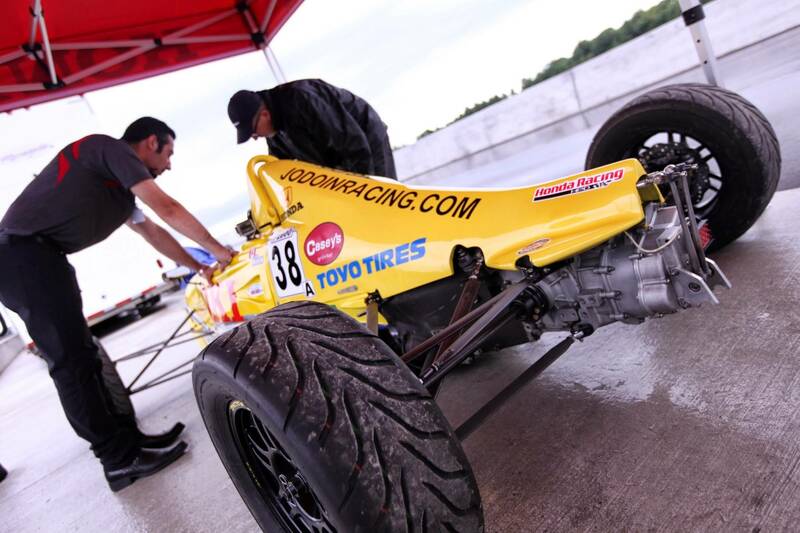 Our first activity of the day would be to drive the $85,000 Formula F1600 race car. I began to sweat. They outfitted us in thick, fire-retardant jumpsuits and heavy helmets. I’ve twice attempted to learn how to drive a manual transmission. When I was 16 years old, a patient and trusting friend with a used Suzuki Sidekick attempted to teach a bunch of girls in the high school parking lot, with little success. Having Britney Spears’ Drive Me Crazy blaring probably didn’t help. I also recall, not as fondly, practicing with my dad in his convertible. That lesson may have lasted all of 10 minutes. And that’s how a 31-year-old has avoided learning to drive a stick. Pathetic. It was generally agreed that I’d sit out the first round, but would get a mini-lesson at some point before riding the race car. The break gave me an opportunity to interview James Hinchcliffe, the 27-year-old IndyCar superstar from Oakville, Ont. Crisis (or crash) averted, at least for now. After the racing session, our team took a shuttle van to the nearby karting track. Now, when I say track, I’m not talking your off-the-highway, next to the motel kind of establishment. The Kart Complex’s circuit measures 1.4 kilometres. After the F1600, the go-karts looked like toys. Karting appealed to me because I had experience driving go-karts as a child in Dryden, Ont., so basically I was semi-pro. Just gas and a brake pedal. Even eight-year-old children could operate these things! What quickly became clear, however, was that I was slow. After zooming around the track a few times, we held time trials. Two crewmates and instructor Daniel Morad – who is a world karting champion – lapped me, and I came in last place. If I were a Mario Kart character I’d be Princess Peach’s grandmother: braking at every turn, checking non-existent rear-view mirrors, and signalling. It’s not that I’m a bad driver, I’m just defensive (thank you, Young Drivers of Canada). Apparently the way I drive in real life is not appropriate for the race track. In an effort to cheer me up following the race, Morad informed me I was the only person who didn’t spin out all day. I didn’t consider this a feather in my cap; it’s like telling the hall monitor she’s the most punctual student in school. For the final session of the day, we got to test drive the souped-up Honda Civic Coupe Si with racing instructor Jeff Boyce. Again, because of my – let’s call it ‘manual deficiency’ – I rode shotgun. We whipped around the course at a white-knuckle pace of 120 km/h. It may not sound all that fast, but given how small the course is, and how tight the turns can be, it felt like we were flying. There’s something thrilling about tearing around the track in an “everyday” car. Your brain says “no, this isn’t right” but your heart says “Let’s keep doing it!” Boyce’s skill was impressive – dodging pylons while explaining the art of driving standard, and instructing the drivers behind through the walkie talkie in his left hand. 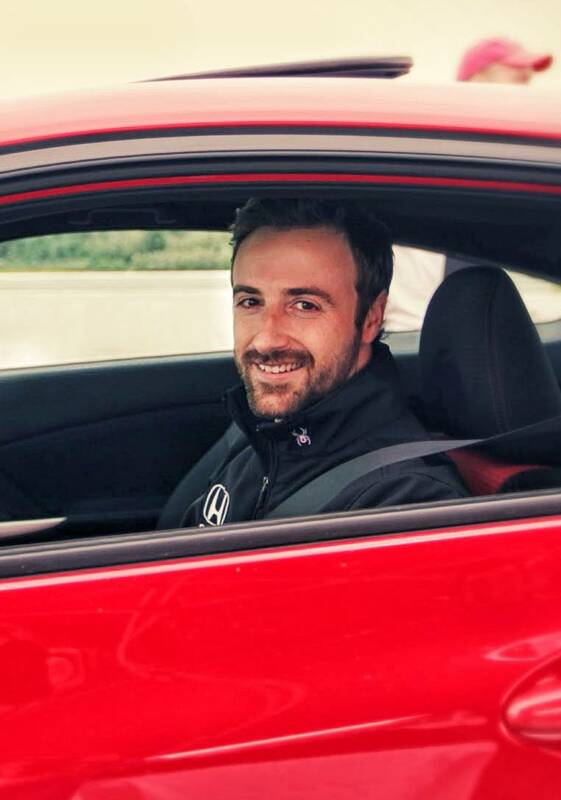 Jeff Boyce, racing instructor, was able to dodge pylons, explain the art of driving stick, talk on a walkie talkie and even pose for a photo while driving the Honda Civic Coupe Si. After about seven laps, and feeling a bit dizzy – like I was on a carnival ride – I hopped out and headed back to the main track. It was time I faced my fear. The moment of truth came when one of the staff members at Honda Canada asked if wanted to turn in my driving suit. It was getting on in the day, and things were starting to wind down. I took a deep breath, looked out at the race car down on the track, and told her “No, not yet. 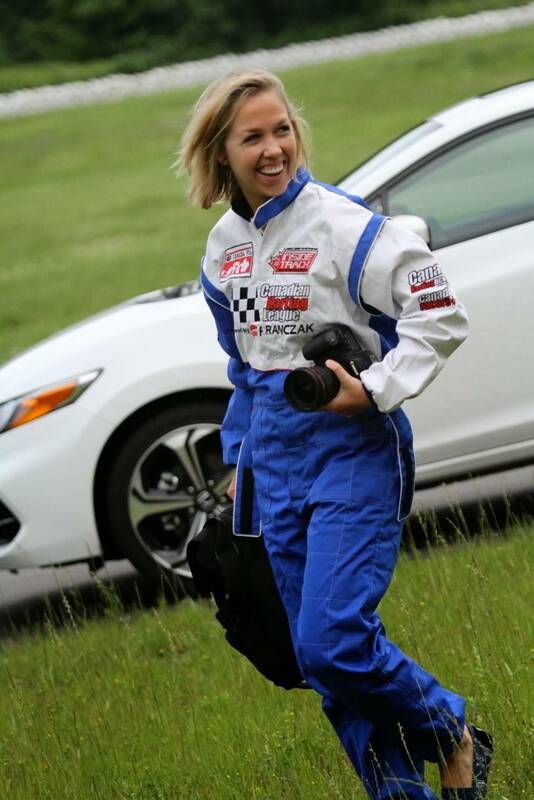 I’d still like to ride in race car.” I walked over to Ostella and told him I was ready to go. He handed me an earpiece that plugged into the helmet. This would be my lifeline on the track. He then gave me a 30-second overview of the components in the cockpit, including the stick shift, clutch and ignition. The steering wheel, which was smaller than I thought it would be, and resembled something you’d see in an arcade. I mustered every bit of the courage I could find, as worst-case scenarios flashed through my mind. Me: a fiery heap at the side of the road, stalling the engine halfway down the track, shredding the transmission as everyone watched and pointed. They were all bad. But no image was worse than me chickening out. Heart beating, I hoisted myself into the narrow cockpit. It was then I realized that this sport wasn’t designed for big-boned people, or even medium people. My legs didn’t quite reach the pedals, so they put in an extra cushion behind my back. 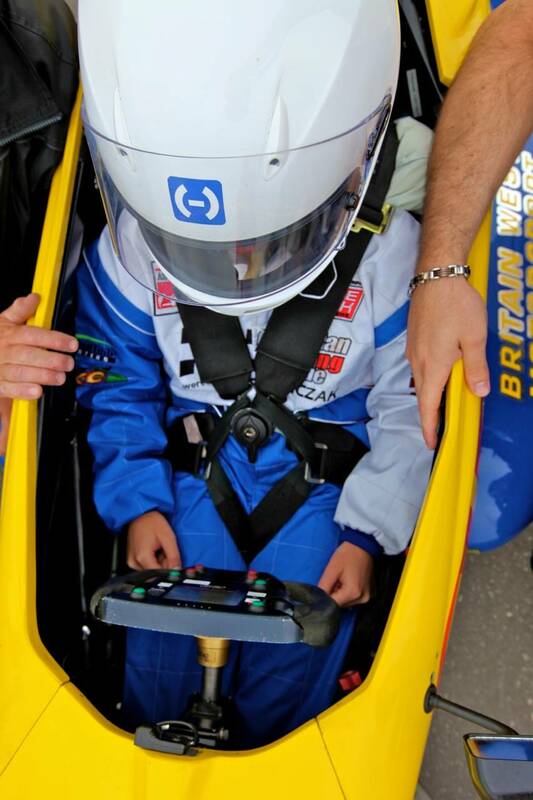 Next they clamped me in tight with the seat-belt: It’s a strange feeling being fastened so tightly to a machine. If you roll over the vehicle you’ll be safely locked into place, but I couldn’t help but feel restricted. The gear shift is a rather small, flimsy lever at the right of the car, and the ignition is a big red button on the left. Next they screwed in the steering wheel, which was smaller than I thought it would be, and resembled something you’d see in an arcade. It was covered with warning lights and information like lap times, oil, water and gearbox temperatures and fuel mileage. A look inside the cockpit. Ostella helped me out by starting the engine. After pushing in the clutch and putting it into first gear, I made it about four feet before stalling. But on the second run, I revved it up and felt the engine roar and rumble beneath me: the car has very little suspension, you can feel everything. Being so low to the ground – almost eye-level with the surrounding tires – I only had a moderate view of the course. I didn’t take the turns too quickly because all I could think was ‘I’ve got to get this into second gear!’ and I did. It wasn’t the smoothest gear shifting, but I was proud of myself, and grateful that the car was still running. With every second in the driver’s seat, I gained more confidence and picked up more and more speed. By the third lap, I was feeling good. Confident, even. I did a thumbs up as a I raced by the crew. As a cautious driver, I don’t think my top speed ever exceeded 100 km/h. (Also: the image of crashing into a wall or blowing up hadn’t entirely escaped my mind). I stalled the engine on the last lap coming in and had to restart the car. I did it, too – on a hill, no less. It’s ironic, but for me racing wasn’t about being the fastest. It was about doing something that terrified me and realizing that it wasn’t so bad. In fact, it was pretty fun. Katherine Scarrow and David Ostella at the conclusion of her race.